These descriptions of the types of hypothyroidism are Dr. Thompson’s discoveries, based on his 13 years of clinical experience with patients with these conditions and his wide knowledge of biochemistry, physiology and human nutrition. The medical profession does not generally recognize them thus far, and, in fact, they are being described as five distinct types in this book for the first time. It would not be surprising if they are ridiculed by mainstream medical practitioners out of ignorance. The thyroid, a tiny butterfly-shaped gland that straddles your windpipe, weighs less than an ounce. It sends signals to every one of the trillions of cells in your body, billions of times every single day. It governs the metabolic rate of every cellular and bodily function. Without your thyroid, you’d wind down like a child’s toy. Eventually, you would die. Many experts, including me, believe that thyroid disease is the most underdiagnosed illness in America. A paper published in the Journal of the American Medical Association nearly 60 years ago asserted that low thyroid function or hypothyroidism is the most common disease of those who enter a doctor’s office. We know today, hypothyroidism is the diagnosis doctors most often miss. I have found in my practice that thyroid hormone resistance (as described for the first time in The Calcium Lie in 2008) is beyond epidemic level. 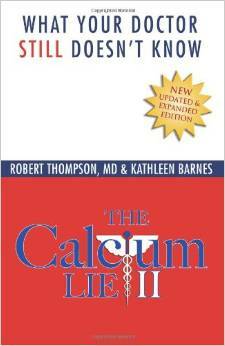 It is now at a pandemic level and it is directly related to excess dietary calcium. The problem is much worse today because most doctors will simply take a TSH (thyroid stimulating hormone) blood test and pronounce that your thyroid is “fine” based on outdated testing procedures and reference levels that are often “normal” even when you show all the classic signs of low thyroid function (hypothyroidism). I can’t even begin to document how many of my patients were told this untruth before they came to me. Physicians have so heavily relied on blood tests to make the diagnosis of hypothyroidism that they no longer recognize the actual symptoms and physical findings that often are present in patients with allegedly normal TSH levels that are actually clinically hypothyroid. That’s why patients with the wide range of symptoms we know are indicative of hypothyroidism frequently have so much difficulty getting a diagnosis and treatment. By conservative estimate, 80 to 90 percent of the population has at least some degree of hypothyroidism. Clinical symptoms are present and yet patients’ complaints are often unrecognized or ignored by doctors. In fact, many people with hypothyroidism have been labeled as hypochondriacs by one or more doctors and they are often treated for depression when their problem is actually low thyroid function. There is a connection between excess calcium, mineral deficiency and hypothyroidism. is the failure of the thyroid glands to produce sufficient quantities of thyroid hormones to keep the body running properly. It is classically diagnosed by blood tests, specifically by a patient having an elevated TSH level (indicating low thyroid hormone production). The new upper level of “normal” was reduced to 3.0 by the American Endocrinology Association in 2011, but it should be much lower based on overwhelming scientific evidence. Most labs still report upper normal as around 4.5 (with a “normal” range of 0.45 to 4.5). is thyroid hormone resistance. Adequate levels of the hormones are being produced, but the body is simply not able to recognize or use them, similar to the problem with type 2 diabetes. Type 2 hypothyroidism is diagnosed by signs and symptoms, low basal body temperature (less than 97.8), and by ruling out type 1 hypothyroidism by having a more normal TSH of less than 2.0. It’s common for people to have more than one type of thyroid disease. For example, patients with type 1 can still have thyroid hormone resistance, type 2, and they need slightly greater than normal hormone replacement doses to correct their metabolic rate. is the presence of autoimmune thyroid disease, probably caused by bromine exposure or some other toxicity to the gland with secondary inflammation. It’s usually called Hashimoto’s thyroiditis, but there are several other forms. or severe selenium deficiency (SSD) is rare. I have seen only one case that I could actually accurately diagnose, but there may be many borderline cases and some type 1 patients may have severe selenium deficiency as an underlying cause of their problems. 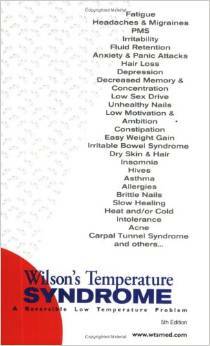 was described in 1992 by Dr. Denis Wilson as “Wilson’s Temperature Syndrome.” He associated the lower basal body temperatures and symptoms of hypothyroidism with an elevation of reverse T3 or RT3, a thyroid-blocking hormone of the actual active thyroid hormone called T3. Most patients with type 5 hypothyroidism, if it is recognized at all, are merely being treated incorrectly with T4 alone (called Synthroid or levothyroxine). This is exactly how most of the people in the U.S. and worldwide are incorrectly treated for hypothyroidism today.